After going through a deployment of integrated SSRS with MOSS I figured it would be good to post up a bunch of references that may help. Microsoft SharePoint Products and Technologies Team Blog – Good inspirational read. Configuring Reporting Services for SharePoint 3.0 Integration – Read this before getting started. How to: Configure SharePoint Integration on a Standalone Server – Please please please read over these installation instructions first before going off and just doing this. I had a SQL/MOSS dev box with no reporting services at all and I wasted tons of time (obscure error I had with SQL SP2 - make sure you stop wmiprvse.exe and this will help too). Installing the Reporting Services Add-in – Did not know about this, just thought is SP2 I needed. This will add in a feature into MOSS Central Administration. As well, I had a situation for some reason 32 bit SQL was running on a 64 bit box with MOSS on it (it is a dev box so no real harm). This article shows how to run SSRS using SQL 32 bit on a 64 bit IIS however that will break MOSS so we had to do a SQL upgrade to 64 bit. I have not run into this yet but I will be setting this up in a distributed environment. I do know that once I do that, Kerberos authentication will be required for a double hop if reporting services is on a different machine than MOSS (similar issue with K2). Some colleagues sent me the following links to help me through this when I get there (SharePoint and Kerberos, forcing NTLM 1, forcing NTLM 2). Hi, thanks for the post. We currently have SSRS installed in integrated mode to run with our MOSS server. When we tried to install K2 we got this error "The report service is running in SharePoint integrated mode. This is currently not supported for K2 Reporting components." Any ideas how to get around this? If we change our SSRS connection to native mode we will lose the integration with SharePoint, which we currently have SSRS reports on. We are at a lost on how to proceed. The are several reasons why integrated SharePoint SSRS will not work. Some are technical. 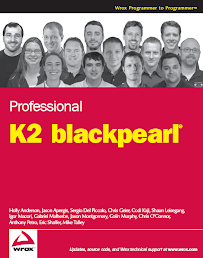 However all of these reports are accessible through K2 workspace which is their asp.net web site that is used by administrators, developers and users to work with k2 blackpearl server. Those reports cannot be run through SharePoint. The only way around this would be to have two separate installs of SSRS. SSRS does not have to run on the same machine as SQL and I have in the past set up multiple SSRS machines on their own IIS box. Each SSRS box can use the same SQL box. The one thing is MS licensing is a little frustrating when it comes to this because they say you have to have a get a second SQL lic for each IIS box that you install SSRS on (http://www.microsoft.com/sql/howtobuy/howtolicensers.mspx). I think your only solution right now would be to set up a different SSRS machine that will be used by K2. This make sure that your existing reports that are running on SharePoint will continue to work.